The University of North Carolina System is comprised of 16 constituent institutions throughout the state that form a multicampus public university. Consolidation of the state's public educational institutions began in 1931, when Governor O. Max Gardner proposed consolidating the University of North Carolina (now the University of North Carolina at Chapel Hill), North Carolina State College of Agriculture and Engineering (now North Carolina State University), and the North Carolina College for Women (now the University of North Carolina at Greensboro). His primary objectives were to eliminate unnecessary duplication of functions of the three institutions and to create a nationally distinctive university. But it was a report on governmental efficiency and economy commissioned by the state from the Brookings Institution in 1930 that gave the final impetus to consolidation. Frank Porter Graham, then president of the University of North Carolina in Chapel Hill, served as the system's first president, and a single board of trustees, consisting of 100 members, was appointed with full authority to manage the three campuses. Additions to the consolidated UNC System followed. In 1965 the General Assembly added a fourth campus, the University of North Carolina at Charlotte, and in 1969 it added the University of North Carolina at Asheville and the University of North Carolina at Wilmington. In 1971 the General Assembly passed legislation bringing into the University of North Carolina System the state's ten remaining senior institutions: Appalachian State University, East Carolina University, Elizabeth City State University, Fayetteville State University, North Carolina Agricultural and Technical State University, North Carolina Central University, North Carolina School of the Arts, Pembroke State University (renamed the University of North Carolina at Pembroke in 1996), Western Carolina University, and Winston-Salem State University. Each of the 16 constituent institutions is headed by a chancellor, who is chosen by the UNC Board of Governors on the president's recommendation and is responsible to the president. Each institution has a board of trustees, consisting of eight members elected by the UNC Board of Governors, four appointed by the governor, and the president of the student body, who serves ex officio. Each board has extensive powers over the operations of its institution on delegation from the Board of Governors. In the early 2000s the 16 campuses had a combined enrollment of nearly 170,000 students and offered more than 200 degree programs. In addition to an array of liberal arts programs, the system has 2 medical schools and a teaching hospital, 2 law schools, a veterinary school, a school of pharmacy, 10 nursing programs, 15 schools of education, 3 schools of engineering, and a specialized school for performing artists. The UNC System presidents under consolidation have been Frank Porter Graham (1932-49); Gordon Gray (1949-55); William C. Friday (1956-86); C. D. Spangler Jr. (1986-97); Molly Corbett Broad (1997-2005); and Erskine Bowles (2005-). 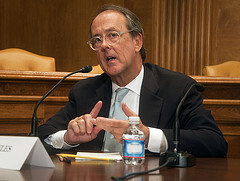 Erskine Bowles retired as UNC system president in 2011. He was succeeded by Thomas W. Ross on January 1, 2011. Ross was succeeded by Margaret Spellings on March 1, 2016. Donald A. Lockmiller, The Consolidation of the University of North Carolina (1942). Brookings Institution. Report on a survey of the organization and administration of the State Government of North Carolina. Washington, D.C.: [s.n]. 1930. http://hdl.handle.net/2027/coo.31924014070506 (accessed October 26, 2012). North Carolina. Commission on University Consolidation. Report of Commission on University Consolidation. Raleigh, N.C. : [s.n.]. 1932. http://archive.org/details/reportofcommissconsol (accessed October 26, 2012). Ford, Guy Stanton. Report to the North Carolina Commission on University Consolidation. [Chapel Hill, N.C. :] 1932. https://archive.org/details/reporttonorthcar00ford (accessed October 26, 2012). "Government Records Branch of North Carolina: University Records." Division of Archives and Records. http://www.records.ncdcr.gov/colleges.htm (accessed October 26, 2012). Gill, Edwin M., editor. Public papers and letters of Oliver Max Gardner: Governor of North Carolina, 1929-1933. Raleigh, N.C. Edwards & Broughton Company. 1937. p.xxxvii-xxxviii. http://digital.ncdcr.gov/u?/p249901coll22,424704 (accessed October 26, 2012). King, Arnold K. The Multicampus University of North Carolina Comes of Age, 1956-1986. Chapel Hill: University of North Carolina, 1987. Wilson, Louis Round. The University of North Carolina Under Consolidation, 1931-1963: History and Appraisal. Chapel Hill, N.C.: University of North Carolina, Consolidated Office, 1964. Wilson, Louis Round. "University Consolidation and Its Impact on North Carolina." North Carolina? : s.n., 1963. "Erskine Bowles." September 21, 2011. Flickr user New America Foundation. http://www.flickr.com/photos/newamerica/6189724871/ (accessed October 26, 2012). Trumble, Tim. "ACE_Sun097: Molly Corbett Broad, president of ACE." 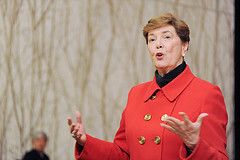 March 11, 2012 in Los Angeles, California, Flickr user ACEducation/American Council on Education. http://www.flickr.com/photos/55463487@N07/7071599621/ (accessed October 26, 2012). 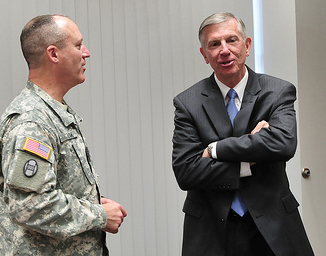 "N.C. Guard and UNC Board Of Governors Sign Cooperatve [sic] Agreement." October 25, 2011, Raleigh, N.C. Flickr user North Carolina National Guard. http://www.flickr.com/photos/ncngpao/6281821966/ (accessed October 26, 2012).